A dragon clutches his red pearl as smoke billows from his nostrils in this stunning dragon incense burner. Lift off top incense burner is designed for cones. Hand painted resin is 12 inches tall. Item Number: PT-10706 | Approximate Size (Inches): 6.75 wide x 4.75 deep x 12.00 high | Approximate Shipping Weight: 2.50 lbs. 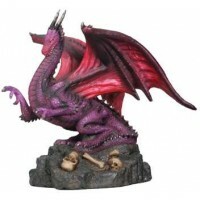 This small cold cast resin dragon statue packs a lot of detail in a statue .. Cold cast resin with a felt lined interior, this lovely box is 3 1/2 inches..